Family is still a dirty word in the workplace. Why is it so hard to juggle a family and career? MT's feature on 'Power Parents: Having It All?' provoked a strong debate. Here, one working mother explains why she was bitterly disappointed that 'having it all' appears to only be possible if you can afford full-time help. As a formerly-single working mother, I read ‘Power Mums: Having It All’ with interest. But I was bitterly disappointed - I don’t think it accurately reflected the majority of working mothers. Your interviewees were very senior executives who all had full-time nannies or a stay at home parent. Having this ‘luxury’ of full-time, live-in help makes a big difference. After-school clubs, home-cooked food, the endless washing and ironing of school uniforms, and keeping on top of school projects and housework becomes easier. You cannot do all that and work 10-12 hour days. But if you don’t put in the long hours, it is far more difficult to get a promotion. Eight years ago, I was a single mother with a three year old son and a full-time job in HR for a large financial services provider. I had no help in the home and my only childcare was full-time nursery. Looking back, I wonder how I survived the emotional turmoil and exhaustion. I was eventually forced out of the job because the company felt I wasn’t pulling my weight (I wasn’t in at 8 and I left before 7). There were times when I cried the whole way to work because I’d taken my son to nursery when he was sick and left him begging me not to leave him. After I quit, I vowed I would never put work before my son ever again. 'Power Mum' Sara Bennison, a director at Barclays, has four children. She gets up at 5.30am and has a nanny that cooks. Luckily I was able to find a job closer to home. I temporarily employed an au-pair when my son went to junior school so he could go to clubs and have friends to play. I remained single until four years ago and am now married again. I still don’t have full-time help in the home but I do have a more senior job and am just about to take another step up the career ladder. We should hear more about how people can progress from lower-paid positions when they can’t afford nannies. The women featured in MT certainly don’t represent me or my challenges; past or present. That’s not to say they haven’t worked hard - I’m sure they have and I am delighted to see intelligent hard-working women at the top of their game. What disappointed me the most is the sense that they’ve all had to downplay their family commitments or hide them, and that they seemed more committed to their jobs and companies than they did their children. I came away with the sense that, for women in business, family is still a dirty word and you must be some kind of Nicola Horlick working 24 hours a day to achieve any major successes or advances. For many women that is utterly unachievable, and how many would want that life? Work is important; it pays the bills and gives one intellectual stimulation and challenges. It does not, however, give you the unconditional love and joy that your child does. And I know from bitter experience that companies have no hesitation in letting you go, regardless of the effort, energy and commitment you have shown, if they don’t want you anymore. Your child will never do that. The moment my son was born, I knew which side would win. 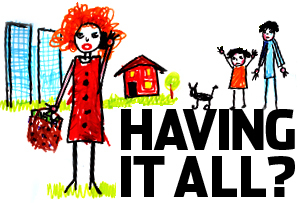 I know things are getting better for women in the workplace, but having read ‘Having it all’, it really doesn’t feel like enough. - The writer of this article is an internal communications director for a leading high street brand. She has chosen to remain anonymous.